For years, the Chevy Cruze has been one of the most popular compact cars in America. The Cruze has built a reputation for being a compact with efficiency, performance, technology and reliability. 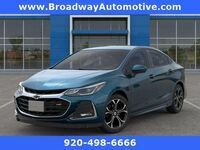 Now, drivers can get their hands on the latest and perhaps best edition of the compact model, the 2019 Chevrolet Cruze, at Broadway Auto in Green Bay! That’s right, the 2019 Chevy Cruze is finally here, and if you’re interested in learning more about the compact sedan, then you’ve come to the right place! For this model research page, we’re going to take drivers through everything that they need to know about the 2019 Chevy Cruze including its engine specifications, efficiency, technology and safety features! Let’s see what the Chevy Cruze has in store for drivers in 2019! Test Drive the 2019 Chevrolet Cruze at Broadway Auto in Green Bay, Wisconsin, Today! Let’s start by seeing what the 2019 Chevy Cruze has underneath its hood! The 2019 Chevy Cruze has two available engines to offer drivers. First, there’s the standard 1.4-liter Turbo ECOTEC 4-cylinder engine that offers an impressive 153 horsepower and 177 lb-ft of torque to go along with an EPA-estimated highway fuel economy of 38 mpg! Then, the 2019 Chevy Cruze kicks it up a notch with the available 1.6-liter Turbo-Diesel ECOTEC 4-cylinder that can generate up to 240 lb-ft of torque and still get an incredible highway fuel economy of 45 mpg! Talk about a best of both worlds! On the inside of the 2019 Chevy Cruze, drivers will find a roomy interior filled with the latest entertainment and convenience features for a better driving experience. The standard 7-inch diagonal color touch-screen display also comes standard with Apple CarPlay, the smartphone integration functionality so you can take all your music, apps and even Siri in your car with you! Plus, the available built-in 4G LTE Wi-Fi hotspot means you never have to burn up your cellular data while on the road again! As fun and exciting as those features and technologies are, the most important thing is always safety. 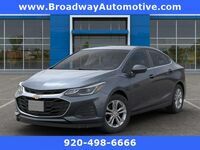 Which is why the 2019 Chevy Cruze also offers some of the latest driver-assist technologies and safety features like the Low-Speed Forward Automatic Braking, Lane Keep Assist with Lane Departure Warning and Lane Change Alert with Side Blind Zone Alert. Perhaps its best feature, though, is the Teen Driver Technology, which lets parents place restrictions on things like audio and seat belts while also helping teen drivers learn safe driving practices! Want to learn more about the 2019 Chevy Cruze? Ready to get behind the wheel of one? Contact our staff at Broadway Auto for more information or to schedule a test drive today! Interested in a Chevrolet Cruze?